New evidence found in northwestern Australia suggests that a massive asteroid, 20 to 30 kilometres in diameter, struck Earth about 3.5 billion years ago. This impact would have dwarfed anything experienced by humans, and dinosaurs, releasing as much energy as millions of nuclear weapons. Impacts this large can trigger earthquakes and tsunamis, and change the geological history of Earth. The evidence was uncovered by Andrew Glikson and Arthur Hickman from the Australian National University. While drilling for the Geological Survey of Western Australia, the two obtained drilling cores from some of the oldest known sediments on Earth. Sandwiched between two layers of sediment were tiny glass beads called spherules, which were formed from vaporized material from the asteroid impact. The enormity of this impact cannot be overstated. “The impact would have triggered earthquakes orders of magnitude greater than terrestrial earthquakes, it would have caused huge tsunamis and would have made cliffs crumble,” said Dr. Glikson, from the ANU Planetary Institute. This asteroid impact is the second oldest one that we know of. It is also one of the largest found yet, and at 20 to 30 kilometers in diameter, it is 2 the 3 times the size of the famous Chicxulub asteroid that struck the Yucatan in Mexico. That impact is thought to be responsible for ending the age of dinosaurs on Earth. “Material from the impact would have spread worldwide. These spherules were found in sea floor sediments that date from 3.46 billion years ago,” said Glikson. At 3.46 billion years ago, this puts this impact event close to a period of time 4.1 to 3.8 billion years ago known as the Late Heavy Bombardment. This was a period of time when a disproportionate number of asteroids struck the Earth and the Moon, and probably Mercury, Venus, and Mars, too. The Late Heavy Bombardment was probably caused by the gas giants in our Solar System. As these planets migrated, their gravity caused enormous disruption, pulling objects in the asteroid belt and the Kuiper Belt into trajectories that sent them towards the inner Solar System. The surfaces of Mercury and the Moon are covered in impact craters. Samples of rock from the lunar surface, brought back to Earth by the Apollo astronauts, have been subjected to isotopic dating. Their age is constrained to a fairly narrow band of time, corresponding to the Late Heavy Bombardment. Obviously, the Earth would have been subjected to the same thing. But on geologically active Earth, most traces of impact events have been erased. It’s the sediment that hints at these events. Australia is geologically ancient, and contains some of the most ancient rocks on Earth. Glikson and Hickman found the glass spherules in cores while drilling at Marble Bar in north-western Australia. Because the sediment layer containing the spherules was preserved between two volcanic layers, its age was determined with great precision. For over 20 years, Dr. Glikson has been searching for evidence of asteroid impacts. When these glass beads were found in the core samples, he suspected an asteroid impact. Testing confirmed that the levels of elements such as platinum, nickel and chromium, matched those in asteroids. This is not the first evidence of impact events that Glikson has uncovered. In 2015, Glikson discovered evidence of another massive asteroid strike in the Warburton Basin in Central Australia. At that site, buried in the crust 30 kilometers deep, in rock that is 300 to 500 million years old, Glikson found evidence of a double impact crater covering an area 400 kilometers wide. This crater was believed to be the result of an asteroid that broke into two before slamming into Earth. “The two asteroids must each have been over 10 kilometers (6.2 miles) across — it would have been curtains for many life species on the planet at the time,” said Glikson. Finding the sites of ancient impacts is not easy. Advances in satellite imaging helped locate and pinpoint the Chicxulub crater, and others. If there have been hundreds of enormous asteroid impacts, like Dr. Glikson suggests, then they would have had an equally enormous impact on Earth’s evolution. But pinpointing these sites remains elusive. Sorry for test, registration seems a little weird. I’d like to see scientific evidence that the world is 6,000 years old. Your opinion is trumped by facts. So why do you bother to troll? This occurred about 300 mil yrs after the generally accepted end of the Late Heavy Bombardment period (4 by – 3.8 by). So that period will need to be extended. This is also after the generally accepted beginning of life on Earth. And it may have been an event that boiled off the oceans, leaving the only survivors being extremophiles living under the subsurface of the boiled-off oceans. I’ve heard the view expressed that no matter what catastrophe that the Earth endures (short of a rip apart destruction of the planet); life will regenerate and come back. That hard to argue against given the scientifically derived geological history of this planet. FWIW I made a comment that responds to your suggestion on extremophiles. That is a puny impact compared to the ones hitting the Moon. but 2-3 times as massive as Chicxulub. The dating of the Moon material may have been contaminated by the last impactor on the side facing us. The “fairly narrow band in time” suggests that is the case. And all zircons older than 3.5 Ga lacks the typical impact fractures that else is seen in zircons around craters like Vredesvort. Our own geological record rather points to a lull in impact flow. That is also consistent with all of the rare earth elements and most of the volatiles could have been delivered long since, with the early bombardment after the Moon impact. In sum, our own geological record is in tension with that of the Moon, which can’t be verified as clean. 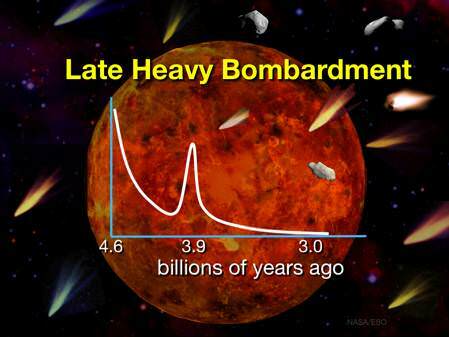 The scientists that like the late bombardment are planetary system modelers. They see a Jupiter/Saturn migration and resonance as predictive of many features in the outer planetary system. However, that could easily have happened early on, and Batygin’s suggested model of an early Planet Nine migration is consistent with it. Some astrobiologists also like it, since they claim it can predict the observation of thermophily at the root of our phylogenetic tree. But Abramov et al models suggests that is unlikely, since even mesophiles would survive the suggested late bombardment impact flow. Prokaryotes simply proliferate and reseed sterilized areas too fast for the sterilizing impact flow to keep up. A more enticing model is the vent theory of emergence, since that automatically puts thermophiles at the root, no matter other geology of early Earth.